[Sydney, Australia] – This is a big year for 13-year-old student dancer Harrison Lee of Castle Hill. A panel of adjudicators called him a “rare talent destined for the world stage” when they presented him with the prestigious Isobel Anderson Award at a recent Royal Academy of Dance (RAD) competition in Sydney. The  competition attracted hundreds of dancers aged from 12 to 16 from all over NSW, who were culled to 10 finalists who performed to a sold-out audience at The Science Theatre. In addition to the award, Harrison was judged overall competition winner across all age groups. He received the award from Isobel Anderson herself, a patron of the RAD. Harrison is also one of the most promising young dancers in the 2012 McDonald’s Sydney Eisteddfod. A spokeswoman said he won the Wenkart Ballet Championship award for his age group and came second in the modern/lyrical section. He will travel to China later this month to represent his school and country at the Tianjin International Youth Arts Festival. Harrison was also selected to perform in The Premier State Ballet youth company’s production of The Sleeping Beauty later this year at Parramatta Riverside Theatres. His mum Cindy Lee said Harrison had grown and matured as a dancer since he joined the performing arts McDonald College. Copyright © 2012. Fairfax Media. [Birmingham, England] – Samantha Mian was surprised when her son Ethan came home from school saying he wanted to take up ballet. He had been given a taster by Birmingham Royal Ballet, who had held a workshop at his school, James Watt Primary in Handsworth – one of 35 schools visited by the prestigious ballet company as they delivered workshops to 2,500 children. Ethan, six and from Handsworth, was invited to audition at BRB studios and went onto become one of just 80 children selected to start classes at The Lighthouse in Aston and Queensbridge School in Moseley last September. “It was a big shock to learn he had got through as so many kids went for the auditions,” says Samantha, a full-time mum to Ethan and his siblings Ruben, four, and Mia, one. “There’s just Ethan and one girl that got through from his school. It’s a big opportunity and it’s very exciting. Since 1997, Dance Track has enabled key stage one pupils to access ballet, opening BRB’s doors to those who might not ordinarily be introduced to the art-form. In Billy Elliot, a film about a young boy with a passion for dance, the father doesn’t like the idea of his son dancing until he sees him in action. “We get that all the time,” said Pearl Chesterman, BRB’s director for learning.“But we’re actually finding we generally have a 50/50 split of girls and boys taking part. Samantha adds: “Ethan and I watched Billy Elliot and he loved it. It made him want to dance even more. Maybe before, he might have thought ballet was a girly thing to do but it doesn’t feel like that at all now. I think it’s something he wants to carry on doing when he’s older. “His friends are really excited for him and his teachers are very supportive.He’s always coming home and showing me different moves, pointing his toes and stretching his feet. Dance Track continues to work with students who display a particular talent by preparing them for auditions to top ballet schools in the UK, including Elmhurst School for Dance, the Royal Ballet School and English National Ballet School. For Amber Cooke, aged six and from Lozells, it’s given her the chance to fulfil her dream. Last week was the first time parents got to see their children perform. According to Pearl, the BRB teachers can instantly spot if a child has the potential to be a dancer. “When we go into schools, we’re looking for posture, physical ability and concentration,” she says. “With some you can identify that as soon as they walk through the door, with others it comes out during the workshop. “Some of the children come in a bit hesitant to start with, as do their mums and dads. When they come to the BRB studios they’re often excited and a little bit overwhelmed, which is also the case for the parents too. “Many are shocked that their child has been chosen. Some have mixed emotions, asking what’s it all about, what are they going to be doing? It’s about confidence building, team building, about working with each other. “It’s about giving the children another perspective to their world, a way of meeting new people from a different background to them. Some of their teachers have said it’s given the pupils more focus too. They’ve found they have concentrated better in school after taking part in the ballet classes. “It also brings families together to celebrate their child’s successes and be excited for them. Students come to Dance Track from a wide range of white, black and minority ethnic groups, irrelevant of their social and economic background. Christopher Barron, BRB CEO, adds: “The initiative sees BRB developing home grown talent through more equitable routes, opening doors to young people irrelevant of their social and economic background. Let’s face it: In your average ballet class, girls outnumber boys. Toronto, however, just might be ahead of the curve in the trend of boys and dance. Could it be that the current generation of moms and dads was deeply influenced by the film and musical stage play Billy Elliot? Alanna Budhoo, coordinator of Tapshoes & Tutus Dance Co-op in Parkdale, says she’s definitely seeing more boys in her creative-movement classes. “Just like any sport,” she says, “ballet is full of energetic physical activity. Boys especially love all the jumping and athleticism.” She stresses that boys starting ballet at a young age respond to a playful approach to dance, and because she encourages creativity with their natural movements, there isn’t a rigid emphasis on technique. For young kids, pre-ballet teaches the basics, but also gives kids an opportunity to think imaginatively about their body in space. In the same way that piano is a great place to start with music, in some ways, ballet is the ABCs of dance. Check out classes at the Canadian Children’s Dance Theatre (509 Parliament St., 416-924-5657), your community rec centre, or a neighbourhood dance school like Tapshoes and Tutus (1488 Queen St. W., 416-885-7532) and get your burgeoning Billy Elliot into some tights. Perhaps no major theatrical enterprise around today depends so much on the strong legs of a 12-year-old boy as does Billy Elliot The Musical. Billy is on stage for the duration of the show. He must look like an 11- to 12-year-old, be no taller than four foot 10 inches and be able to dance and sing and speak. The original director of the musical compared the role to playing Hamlet while running a marathon. Being Billy is not for the faint-of-heart. The demands of the role mean that there are always four Billys on hand for the touring production to draw upon. One of the Billys who will perform in Ottawa when the run begins here New Years Day is 12-year-old Drew Minard of Des Moines, Iowa. In 2000, the British film “Billy Elliot” generated a flurry of admiration on both sides of the Atlantic. Something about this story of an 11-year-old boy, who decides to study ballet even as it makes him a major oddity in his northern England mining town, touched a nerve. Five years later, transformed into a musical with a score by Elton John, “Billy Elliot” became a runaway hit in London’s West End. It went on to win a slew of Tony Awards, including Best Musical, after its 2008 Broadway premiere. When the touring production of the show arrives Tuesday [December 18] in Baltimore, the audience will include boys around Billy’s age and just as enthusiastic about dancing. They’re members of the Estelle Dennis/Peabody Dance Training Program for Boys, part of the preparatory division of the Peabody Institute. Chosen by audition and awarded free tuition, the students, ages 9 to 16, are put through a rigorous training in classical ballet. It’s the kind of training the fictional Billy embraces, resists and embraces again as he comes to terms with his gift. The Peabody boys, who will also attend a master class with choreography staffers from the show later in the week, easily identify with the musical’s unlikely hero. They’ve all experienced, one way or another, the realization that they need to dance. Such a sight could be something right out of “Billy Elliot.” Billy, unenthusiastic about the boxing lessons his father has insisted on, discovers a ballet class and finds himself drawn in almost instantly, as if his feet had been waiting for such a chance. Billy faces the expected obstacles: knee-jerk opposition from his father and brother, concerned about the boy’s masculinity (Billy does sense encouragement from the spirit of his dead mother); the challenge of affording dance lessons; and, especially, the trip to audition for the Royal Ballet School in London. Set in the mid-1980s, the plot pits the child’s struggles against a backdrop of conflict in the town, where the miners have gone on strike. In the end, thanks to the generosity of the local ballet teacher who first spots Billy’s potential, and of the miners who decide to help out, the boy gets his chance. Providing a chance is what the Peabody dance program is all about. The Baltimore-born Estelle Dennis started dancing at a tender age and kept at it, despite family resistance. She formed a community dance company here in 1934. Before her death in 1996, Dennis arranged for a trust fund that would award scholarships to male dance students in Baltimore, advanced students ready to take bigger steps toward a professional career. When too few such students could be found, the fund’s trustees authorized the creation of a dance training program for boys, launched in 2009 at Peabody Prep. Auditions were held in several Baltimore public schools to put together the first class. About 60 turned out; two dozen or so were chosen. Each year since, there has been a good response to the auditions. Currently, about 30 boys are enrolled in the program. “Once we took the financial factor out of it, providing the free tuition, we discovered there are boys out there,” said Timothy Rinko-Gay, one of the teachers for the scholarship program. Those boys do not necessarily have any experience with ballet. Gordon looks thoroughly at home executing classic ballet steps — coupe, frappe, passe, plie, releve, sous sous (the boys learn a lot of French terms along the way). Asked after a class how many envisioned going on to pursue a dance career, nearly all the boys raised their hands. But 12-year-old Olivier Knopp, whose older brother went through the Peabody program and is now in the America Ballet Theatre’s Studio Company, did hedge his bets. 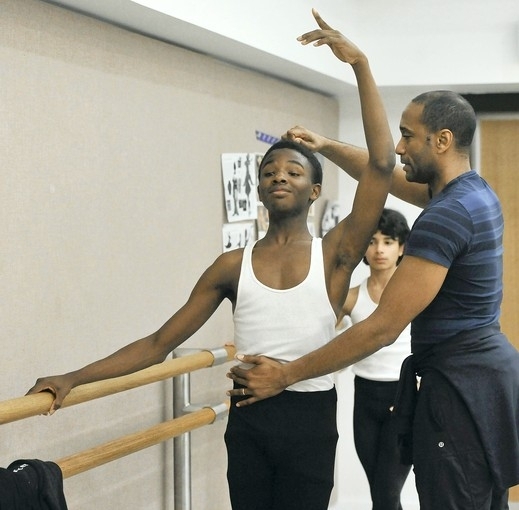 Meredith Rainey, a former soloist with Pennsylvania Ballet, is one of the teachers who put the Peabody boys through their paces, from exercises at the barre to increasingly tricky steps and leaps across the length of the floor. He doesn’t miss much in the rectangular, mirrored dance studio — someone grimacing (“It’s going to hurt”), someone with eyes down (“You can’t look at your feet and do this”). And the teacher keeps things going at a steady clip. Being outnumbered by girls in dance class is not an unusual occurrence for boys. That’s something observed by Nora Brennan when she holds auditions for the lead in “Billy Elliot.” For some boys, being chosen — four at a time rotate in the title role — means their first chance to work with peers of the same gender. One of those life experiences is likely to be dealing with lingering prejudice against boys dancing ballet. There have been periods when dancing was seen as cool for boys — Weisberger recalled increased interest after publicity surrounding the brilliant Russian celebrity-defectors Rudolf Nureyev and Mikhail Baryshnikov decades ago — but that is an exception. All of that is part of the “Billy Elliot” story. Brennan noted that when she asks boys at auditions whether they have ever had trouble at school because of their interest in dance, “pretty much all the hands go up. There are bullying issues. Sometime they tell friends they are going to soccer practice instead of dance class,” Brennan said. And the boys who are accepted into the demanding Peabody program invariably arrive with essential support. “My family is proud of me,” said 11-year-old Devonte Tasker. Nods from his colleagues reflected similar sentiments. If the Peabody imprimatur help boys get past the old stigma, their own conviction and dedication make the biggest difference. Rinko-Gay’s assessment of the current crop of students is upbeat. It’s usually girls who dream of becoming ballerinas and dancers in the West End. But last weekend in Deptford, [UK] there were no girls allowed as nearly 60 boys took part in an exclusively male dance workshop. 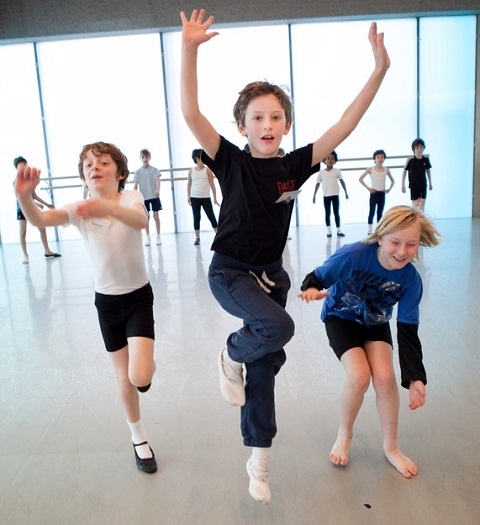 Aged between eight and 18-years-old, the dancers threw themselves into learning three different styles during the two-day programme at Trinity Laban. A highlight saw the boys share their work in the Studio Theatre on the second day in front of an audience of family members, teachers and friends. Teresa Turpin, a mother of one of the boys in the workshop, said: “I wanted to say a big thank you to all involved in the wonderful weekend at Laban. Toby is 12 and really had a fabulous time. He tends to concentrate on musical theatre, just attending the routine dance schools. I really feel he reconnected with his love of dance and is inspired to improve and grow as a dancer. “Everyone was friendly and supportive and managed to get the very best out of him. “I felt so proud watching him dance in the ballet performance, for so long he has been the only boy and it was wonderful for him to dance with other lads and be a true male dancer. Boys Only! London dance workshop was hosted in partnership with The Royal Academy of Dance (RAD). The class combined classic ballet training with energetic, creative and contemporary workshops and stylish street dance.The weekend was open to all boys, no matter their experience, and was a unique way to discover and develop new talents. © Copyright 2001-2012 Newsquest (London) Ltd.
[Half Moon Bay, Ca. USA] About 80 Shely Pack Dancers students, ages, 2 through 16, will perform the classic “Nutcracker” ballet Wednesday, Dec. 19, at Skyline College. The Pack students will perform the holiday classic in its full length at the college theater at 7:30 that night. The students have had lots of time to get ready: the pack school held a special summer camp in July to introduce its students to the complexities of the ballet. 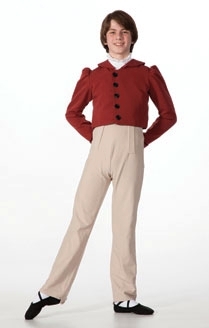 Appearing in the ballet as Herr Drosselmeyer is James Manning, husband of Pack Dancers founder Shely Pack-Manning. Also appearing in the prominent role of the Prince is Half Moon Bay resident JP Viernes. His character is the rebirth of the Cavalier who returns to life after a disastrous battle with the Rat Queen. As such, Viernes has numerous pas de deux dances in the second act, pairing with characters Clara, the Rat Queen and the Snow Queen. It’s all only appropriate for the young dancer who started studying with the Pack Dancers at a very young age. 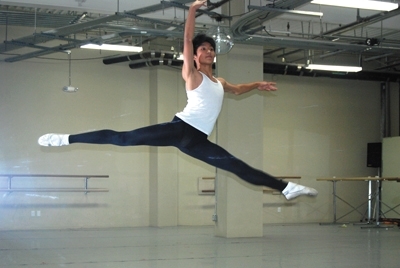 At 16, he is a student at the School of the Arts in San Francisco, heading for a career in dance. In between those times, though, he has crossed the country in the traveling Broadway production of “Billy Elliot” in the title role. He performed the role for two-and-a-half years, and in that capacity, made an appearance on television’s “Oprah” show with Sir Elton John. [Kansas City, Missouri, USA] – When the curtain was raised on the Kansas City Ballet’s 40th annual production of “The Nutcracker” Dec. 1, audiences were treated to performances by several Jewish performers. At least five Jewish dancers are in the production, which has two casts for the young dancers. The Prince, one of the production’s major roles for students, is being played by Shawn Kramarovsky. Other Jewish performers include Stella Shapiro, siblings Greta and Oscar Miller and Natalie Goldman.